Analysis: Watson logged snaps on offense for the fourth straight game, but Sunday saw him make his first career catch. The rookie has been a mainstay on special teams, and the 12 snaps from scrimmage he played against the Bengals represented a career high. Despite his participation level seeing a slight bump in Week 8, Watson remains far down the pecking order in the Buccaneers' prolific air attack. Analysis: Watson's status is expected, considering the Bucs will roll with the impressive quartet of Mike Evans, DeSean Jackson, Chris Godwin and Adam Humphries at receiver, while also keeping the more experienced Freddie Martino active as a fifth wideout. Watson impressed during training camp and preseason, however, so he could certainly find himself suiting up at some point as the season unfolds. Watson brought in all three of his targets for 30 yards in the Buccaneers' 26-24 preseason win over the Dolphins on Thursday, but he also lost a fumble. Watson made a positive impression on head coach Dirk Koetter during Sunday's practice, Scott Smith of the team's official site reports. 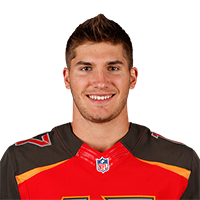 "Today was his best day," said Koetter. "He got some chances. When you're a wide receiver, you've got to get chances. Sometimes you could be out here all day and not have any balls thrown to you. He showed up today. He's got a fight on his hands because it's a deep position." There are no videos available for Justin Watson. Click here to view all videos.